Before we move on to learn the Chinese character which means "100 million", we need to examine another Chinese character "言" first, which means "Say", "Speak" as verb or "Speech" as noun. You might wonder why somehow "Say" can be related to the creation of a Chinese character which means "100 million"? After our explanations with following a few lessons, you will grasp the idea clearly and appreciate the way "100 million" was created that way. Oracle Script was composed with ( is mouth, while looks like the tongue of a snake) and an indicator on top to emphasize the movement of tongue. 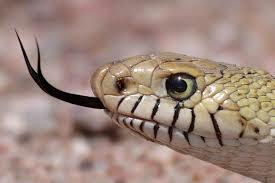 Snakes hiss with their unique shape of tongues. Chinese ancestors noticed it and draw it to mean "using tongue to make sound (to speak)". It is quite a coincidence to the story in Bible, in which Satan changed its form to snake and talked to Eva to allure her to disobey the commands of God. Bronze Script further added an indicator on top, while Seal Script again added another indicator to emphasize “Speak” by movement of tongue. When it evolved to Clerical Script , it could be viewed as just a simplified version of Seal Script . Or our Chinese ancestors might already knew that while we are speaking, waves of sound （ - three waves. note that three can mean a lot in Chinese） come out of our mouth " ". So "言" means "Say", "Speak" as verb. "言" is extended to mean "Speech" as noun, for Speech is what we would like to speak about.